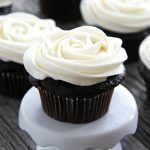 This Marshmallow Vanilla Buttercream Frosting is the perfect icing for either chocolate or vanilla cupcakes! Will ice 12 – 16 cupcakes (thickly), or 24 cupcakes if spread more thin. In a mixer, beat the butter until soft and fluffy. You’ll have to scrape the sides of the bowl several times. This process of getting fluffy butter takes at least 10 minutes. I used a Wilton 1M icing tip for the icing roses.